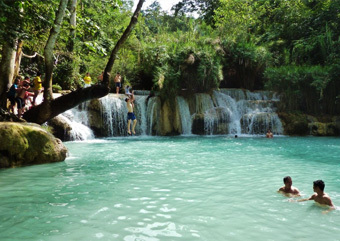 Welcome to Laos, Luang Prabang. After your welcome in town we first have a short transfer to your prefered hotel in town. 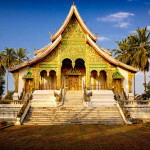 Than explore the beauty of this town on our city tour with visits to Wat Visun, Wat Aham, the beautiful Wat Xieng Thong! 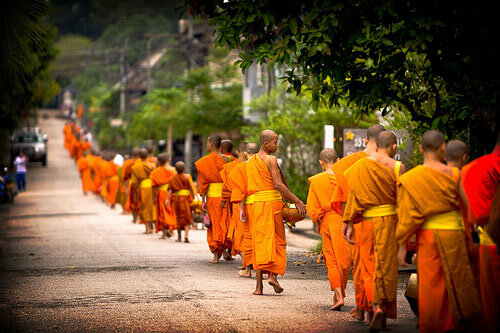 Walking along the Wat Street we also visit the Wat Mai... In the afternoon climb up to Phousi hill for overlooking the city scenery and the amazing sunset. From here we can see the magic Mekong and the small Nam Khan River. Welcome dinner at local restaurant and introduction in Lao food. 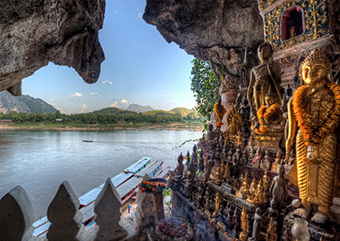 Breakfast at hotel, start your day with a trip by private long boat on the Mekong to the well-known Pak Ou caves. Stop on the way to visit Muang Kham (Lao Lum), if you wish visit Ban Xang Hai (Lao Lum) where the distillation of the rice whisky (Lao Lao) can bee seen...and tasted. 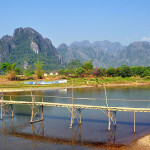 Then continue to Pak Ou, visit the exciting "Tham Ting cave", cross the Mekong to Ban Pak Ou to have lunch. 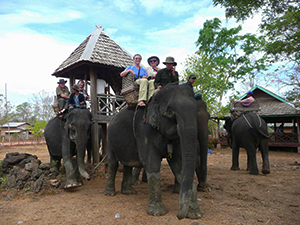 Return to Lang Prabang, drive by car/bus to visit the tomb of Henri Mouhot, the explorer of Angkor Wat in Cambodia. You will enjoy the short walk along the Khan River. By return way, you can shop (if you wish) weaving products in the famous "Ban Phanom" village. Have dinner at restaurant with live traditional music. Breakfast at hotel, excursion by car/bus to the beautiful Kuang Si water fall, on the way stop to visit Hmong-and Khmu villages. 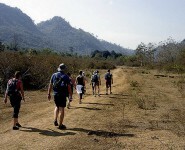 From here we start with our soft trekking program that brings us out into small villages. Along the way we can learn about their way of life and the differences between Lao, Khamu-and-Hmong-culture. 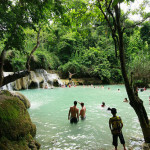 Of course we arrive at the waterfall for a refreshing bath in the afternoon. Transfer back in town in the evening. Picnic for lunch and trekking guides provided for today. 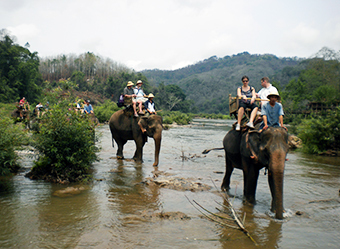 Elephant Programs at Elephant Park Project, Luang Prabang outside of town. 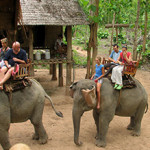 Activities with Elephants combined with Trekking or Kayaking, or a half-day tour on Elephants with waterfall visit. Take your time to visit the vegetable market, the former King's Palace, or other highlights in this little town. You can spend your time to explore the small roads and colonial buildings, or just hang out with the view on the Mekong River. Transfer to the Airport free time to explore. End of service!